Ok so hopefully the hubby doesn't look at this today.. until tonight. I doubt he will cause he's a big time radio Program Director and has majorly important things - meetings - networking to do all day. Ok. So for our first anniversary I bought him this. 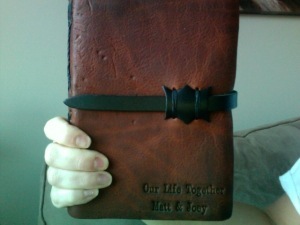 It's a gorgeous leather bound journal. I have an awesome first page... and the idea is to write something in it for BIG occasions. IE; Anniversaries..Birth of children... etc. And every year, for our anniversary we right a note in it that reflects on the things that happened the past year during our marriage. Seriously.. do you SEE how many PAGES ARE IN THERE??? "We are gonna have to be married for eternity to fill that thing up!!!" 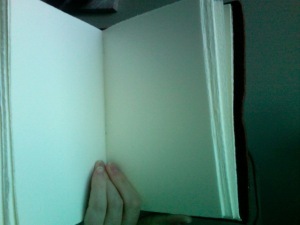 So: I am going to share with you what I wrote in our 'magical journal'. Don't laugh, ok. You know your jealous of our constant love! ha. I know you 'thought' this journal was just for you to write sweet memories.... but time to time, I have to steal it and share mine too. Today marks the start of the third year of our life together. I honestly thought-the first year was crazy....the move, no job, getting job, getting pregnant, being pregnant... I guess all that doesn't even compare to the highlights of the second year as husband and wife. As I look back on the year... there are many things that really stick out in my mind. One big one. On May 25th, 2008 : Boston Matthew Nahigian was born. He was 8 pounds and 5 oz. Yep. I definitely created a monster. That little stinker was not coming out! When I think about that day.. so much of it is a blur but one thing I really remember was your love and care for me. I remember you worrying and caring about my pain... and the issues with the birth. You were so worried about me when things where not going the way it was planned. I could see your love for me in your eyes. You sat there and didn't squirm and when they brought that little boy out all I could do was watch your face. With all the drugs pumped in me and as bloated and awful as I felt... all I wanted to see was your face when I could bring your son into this world. I remember it just like it was yesterday. Your eyes lit up like fireworks. (I must admit, once I was rest assured, I thought I was going to throw up!!) But to know that I 'did good' in bringing your life into this world was such a blessing to me. The next few weeks were a bit rough. I was an emotional crazy woman trying to come to terms that life will never be the same and doing everything I could to make sure our baby would be well taken care of. I had no idea. Quite frankly, WE had no idea! haha. I remember your videos.... oh honey, do I love those videos. Because of you, our families and friends that were so far away got to experience Boston. You religiously took pictures, mailed them out, videotaped Boston and sent the link out to everyone. You made our son a Star. Little does he know right now... His Daddy is the Star. When I lost my job, I thought I was going to tank. But you gave me the strength to keep on going. You told me I was talented and made me feel like I was everything but a failure. The next week, I auditioned for a TV show... and I got it. I remember the day I had a call back.... and the day I got called with the Congrats. You were so excited for me! You always made me feel beautiful. My favorite part of having Boston...... is the mornings. I would get up when he got up, feed him and we would crawl in bed with you and pester you on the weekends. And during the week, you could not wait to get out of bed and go into his room and see his smile. Not many woman can say their husbands are as excited as you are to be a dad. Boston has no idea how lucky he is to have YOU as a father. He is the chosen one. Matt, thank you for sticking by my side and always giving me the strength to try harder. When you saw me hurting from being alone... out of work... over weight... you always made it a point to try and make me feel better. And you always do. So here is to Year 3. May this year be filled with unbelievable memories. May Boston continue to prosper and grow as healthy as can be. May I learn to fight through my sadness and conquer what makes me happy. May you and I find ways to spend more time together. May we always be honest with each other no matter what the situation. May we both continue to teach our son how to be a good person. May we get the chance to share more time with family. May we find and develop more friendships in Philly. May I only think of the positives and stop dwelling on the negative things about myself. And May you always squegee the shower and pick up your clothes in the bedroom. Ok.. well maybe the last one is asking a bit much. ha.